So you’ve decided that you want to sign up for a beta test. Now comes the fun part: choosing which beta you want to join! 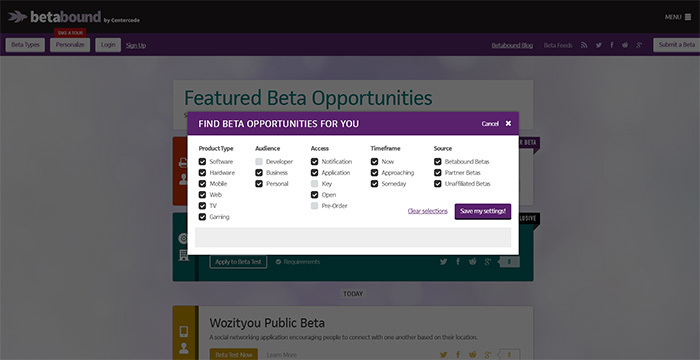 As you’ve probably already noticed, there are many different types of beta testing opportunities on Betabound. In fact, there are so many that it may be difficult to know where to start, or understand exactly which type of beta test is right for you. Some of the opportunities on our site have tags for “Partner Beta” or “Betabound Exclusive” tests. These tags indicate the source of the beta test and are vital to choosing the type of beta testing experience you’d prefer. Let’s go through the different sources of beta testing opportunities offered on Betabound, as well as what you can expect with each one. Private Betabound Exclusives are the betas run by Centercode’s Managed Betas team within our community. These are the traditional tests that longtime members have been participating in for years. They’re run by our experienced beta test managers using Centercode’s software platform. Our team runs tests for all sorts of different products from a variety of tech companies. You’ll use your Betabound login to apply for and participate in these tests. Betabound members will also receive emails about these opportunities before they’re posted on the Betabound homepage, so that they can be the first to apply for the beta tests that catch their eye. These tests are exclusive to Betabound members. You won’t have to create any new accounts. They’re run by expert beta managers who will respond to feedback and provide support. We offer incentives for outstanding participation. Private Betabound Exclusive tests can be very competitive. We often receive ten times more applicants than we have spots within a test. Our tests often have very specific requirements you must meet. Our tests require significant commitment of dedicated time. If you’re interested in applying for these tests, bookmark our feed of Betabound Exclusives or sign up to join Betabound. Partner beta tests are run by companies that have licensed Centercode’s software platform. These are companies that believe in the power of customer feedback and have asked us to help find them enthusiastic testers for one of their products. The testing experience is similar to a Betabound test, however, you’ll have to create an account within the Partner’s beta community to apply for and participate in their beta test(s). As a Betabound member, you will also receive emails regarding these opportunities. You’ll have a similar testing experience to a Betabound Exclusive test. These tests often include incentives for outstanding participation. Once you’ve created an account, you’ll hear about that company’s future opportunities. These tests can be extremely selective and have very specific requirements. You’ll need to create a new account within the Partner’s beta community. If you’re interested in applying for these tests, bookmark our feed of Partner Beta Tests. If a beta test opportunity does not have a tag on it, then it’s an Unaffiliated Beta. These testing opportunities are from companies that are either publicly recruiting testers, or requested that we announce their beta test on Betabound (which we’re more than happy to do, for free). These companies are not affiliated with Centercode or Betabound, and while we do our best to confirm that the company is running a genuine beta test and looking to collect feedback, we cannot predict what the testing experience will be like. On the plus side, these tests can be a great way to work closely with a company creating a new product and can often give you the chance to help shape a new product directly. There are a wide variety of testing opportunities available every day. There are often few, or no, requirements to join. These tests often have more casual time and participation requirements. They’re a great opportunity to connect with small companies developing cool products. The level of support, organization, and engagement in these beta tests will vary. They may not offer incentives for participating. To see a current list of our Unaffiliated Betas, check out this feed of all our available betas. Our aim is to provide our community with a wide variety of beta opportunities and testing experiences. Hopefully this post will help you determine which beta testing opportunities are the best fit for you. Once you’ve decided on your testing preference(s), be sure to personalize your feed settings to reflect your interests using the “Personalize” button above. This way, the Betabound homepage will show you only the opportunities that are most relevant to you when you visit. What sorts of beta tests are you most interested in? Did we miss any pros or cons? Let us know your thoughts in the comments below! See what testing opportunities are available now!